This tutorial is the english translation of "Tutoriel d'installation pour RATOC REX-5570 Series". 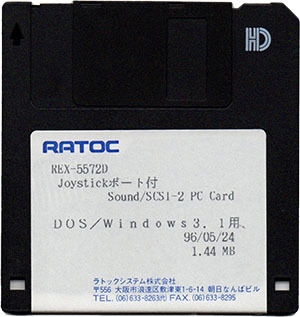 We are going to install a RATOC REX-5572 card on MS-DOS/Windows 3.1. The installation is also possible with Windows For Workgroups 3.1/3.11. Take the Windows 3.1 Installation Diskette of your model (REX-5570 or REX-5572). You can download the drivers here. The installation program is orignally in japanese, the caracters don't display correctly on another language system than japanese. Open the "Files Manager" and on the drive A:\, run "SETUP.EXE". Click on the first button (already preselected). Choose the hard disk path (By default is "[-c-]") the installation folder (by default is "C:\REXAUDIO"). Then click "OK". Confirm the folder installation path. You can choose different installations ways to use the card. It is strongly recommended to leave as such (that is to say : SCSI PCM + JOY + Adlib). It is best to change the IRQ for IRQ 7 for better compatibility in DOS games (be sure to set the card to IRQ 7 in your PCMCIA card manager after that because, despite that, the card will be installed by the manager on IRQ 9). Otherwise, you can leave by default on IRQ 9. Confim the creation of LASTDRIVE for the CD-ROM. At this time, the program loads diskette's files on a temporary folder on the computer and displays this window. Click on the first button (already preselected). After the copy of the files (light green progress bar), the installation program inform you it will modify the files AUTOEXEC.BAT and CONFIG.SYS to load the PCMCIA sound card when your computer starts. You get a new program group with two new softwares : "AUDRACK" and "AUDIOREC". This is "AUDRACK". In fact, it's an audio mixer, a WAV player and a MIDI player. This is "AUDIOREC". It's a recorder for microphone. Restart the PC. At start-up, insert the Ratoc REX-5570 Series card in the PCMCIA slot of your computer. The PCMCIA manager will find the card and will load it. If your card doesn't load at the computer start-up, check the PCMCIA manage in DOS or in Windows and add/change the IRQ of the card for the value you demand while the installation. When you are back in Windows 3.1, in the "Control Panel", be sure to correctly configure the new device "ESS AudioDrive ES1688 4.16.12. Choose the IRQ corresponding to the IRQ specified during installation process. Get the installation disk for Windows 95 of the model you want to install. Get the drivers here. Take the file REX5571W.EXE or REX5572W.EXE (it's a self-extractible zip) et put the file in a new folder. Run this file : a DOS console window appears and run the extract of the files in the new folder you have created. Open the folder called "Change" and run CHANGE.EXE. A windows appears. Click on the first upper button. In the left pane, select "SOUND + SCSI + JOY". Click on "OK" to validate. Click again on "OK" to confirm your choice. Again, confirm your choice by clicking on the "OK" button. The installation program will close. At this moment, push the RATOC REX-5570 Series card in one of the PCMCIA slots of your computer. With the Plug and Play technology, Windows 95 will immediatly recognize the card and automatically install it until this message where we ask you to find the file "REX557x.MPD. It's in the root directory where you have extracted "REX557xW.EXE". Restart your computer to ended the installation. After the restarting, Windows 95 will end to install the card. The driver os only usable on Windows 95. It is not possible to use it in a DOS command window. To use the driver on DOS, you need to install the DOS/Windows 3.1 driver too. It's a good job, Vorro ! Can you give me the name of your PC and its configuration ? Something like that. Is it special utility for DOS runs Adlib/Midi? I can't run adlib out of the box in DOS:/ is any special config/autoexec lines available? What is the whole situation with DOS (7.0 I believe)? Maybe you can send me samples of what you achieved after installation? I don't have this card. But it's great if you can run it on Windows 95. Do you try drivers of the REX-5571 on the REX-5570 ? May be you will be able to run the card under DOS ?